trivago has launched a new tool for its metasearch engine called trivago Express Booking. Just like we did with the launch of TripAdvisor’s Instant Booking and Book on Google, we have analysed trivago Express Booking in detail, trying to answer all the questions which may arise. What is trivago Express Booking? It is just an interface that trivago provides OTAs and hotels with to facilitate the booking process for the client on that channel without redirecting them to the OTA or hotel website. Despite the booking technically being made on the trivago URL, the aim of trivago Express Booking is to be transparent with clients, highlighting the channel’s image at all times and make them feel that they are booking directly on that channel. In order to reinforce this message, they offer the option of redirecting to the channel at all times and doing the booking on there directly. What is trivago looking for with trivago Express Booking? Improving the user experience, particularly on mobile devices, where the jump to the OTA or hotel website can be associated to a loss of clients, whether it is due to unoptimised technology or long response times. With this change, according to trivago, there will be an increase in the conversion ratio that will result in an improved profitability in the campaigns of OTAs or hotels (therefore, more money) and in more satisfied clients. 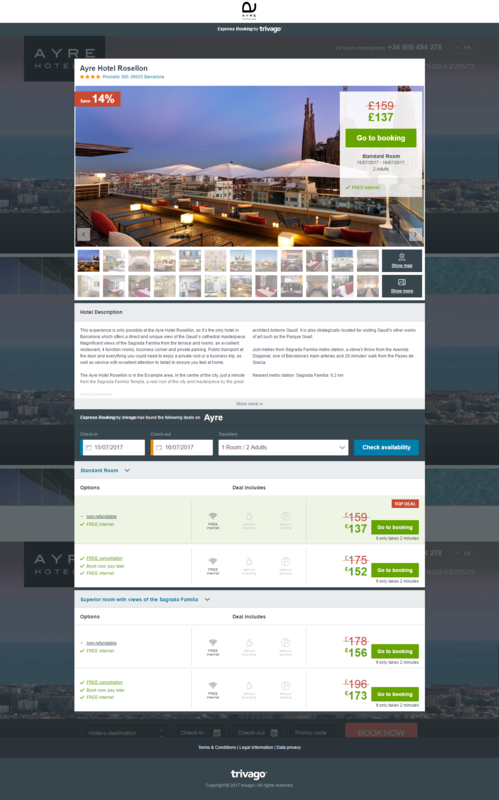 Despite having the aim to improve conversion by facilitating the booking process, a shared purpose with TripAdvisor’s Instant Booking and Book on Google, Express Booking’s strategy is very different and, as we can see below, it puts more effort into positioning itself closer to the hotel and its direct sales channel. How does the client see trivago Express Booking? Among the wide range of channels where to book from usually shown by trivago, the client does not see “Book on trivago” at any time (something which does happen with Instant Booking, where the TripAdvisor brand is highlighted considerably). From where does trivago Express Booking get its stock and prices? From third parties who do have stock: OTAs, wholesalers, tour operators or from hotels (chains and independent ones) who have the required integration with the trivago Express Booking platform. This integration is different to the current one for the trivago price-comparison website and it implies additional development for partners who wish to be integrated. Who sends the booking confirmation email, trivago or the channel? Even though the client used trivago Express Booking to make a booking, its confirmation always comes from the corresponding channel (whether it’s OTA or official hotel website). trivago[DA5] gathers the client’s details and provides them to the corresponding channel, after which it deletes them without storing them in its system unless the client accepts this option in order to speed up future bookings on this channel. How do I connect my direct sales to trivago Express Booking? First you should ask your technology partner if they have the certified integration with trivago Express Booking (remember that it’s an adjustment from the current trivago metasearch engine integration). At Mirai, we are proud to be the first Spanish partner with Express Booking integration. How much does trivago Express Booking cost? Is it a CPC or CPA/commission model? Effectively, trivago Express Booking is free. In other words, it does not imply any additional costs to the current trivago campaign, which does have a cost and is based on the traditional CPC (cost-per-click) model, a model which trivago has always adhered to up to now. trivago does not work with the CPA model (commission). Can I participate on trivago without activating trivago Express Booking? Yes. trivago Express Booking is an option that trivago provides OTAs and hotels with its direct channel in order to improve their clients’ experience and, therefore, improve conversion. Using it or not is up to the OTA or hotel. Will I be able to see the transactions made on trivago Express Booking on Google Analytics? No. 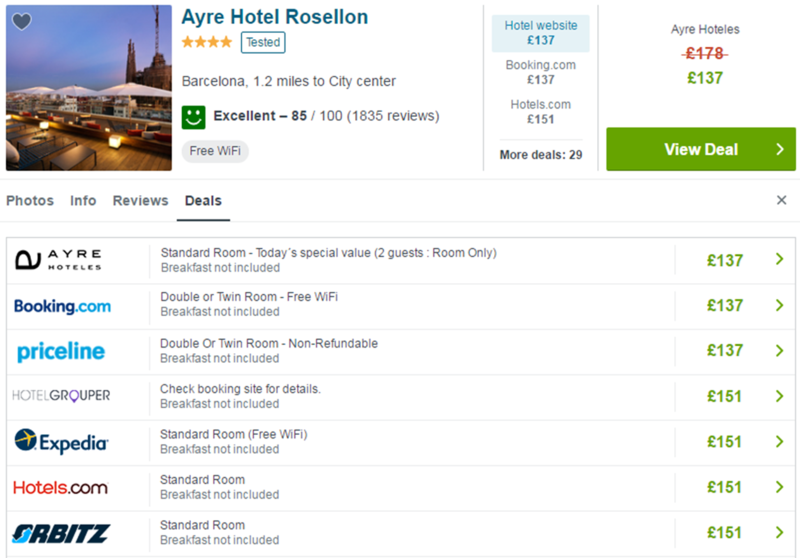 In trivago’s traditional model, where clicking on the result redirects the client to the hotel website to make the booking there, everything was registered on Google Analytics. However, with trivago Booking Express, the transaction is done under a trivago URL and domain. Therefore, technically, the client does not visit your website and Google Analytics’ tracking won’t work, which means that you will miss out on views and booking statistics within Analytics. You will need to take this into account if, up until now, you were making decisions based on results from Google Analytics. However, Mirai will receive the information from bookings made through trivago Express Booking and send them to you in your monthly reports. Should I participate in trivago Express Booking? At Mirai, we always think that the best thing to do in these cases is to try it, measure it and then make a reasoned decision based on numbers and real experiences. If not, there is a high risk that you can miss out on opportunities which are right in front of you and allow hotel and channel competition (OTAs mainly) to seize them and increase their advantage over you.